Crewest is excited to be teaming up with the "LA Barrio Street Art Festival"
September 19th - 21st, 2014. Bell Community Center located at 6250 Pine Avenue, Bell, CA 90201, USA. - Chaz Bojorquez Retrospective: featuring select new works as well as archive photos of his journey as a groundbreaking LA artist. artists including Jesse Hernandez, Fabian Debora, Humo, Ernesto Yerena, Maria Abigail Sandoval, and others. *A complete schedule of workshops and events is on the website. 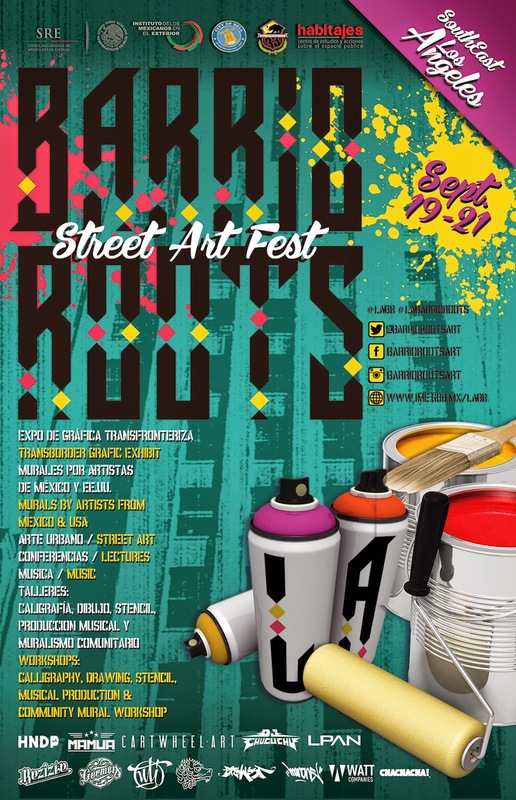 **LA Barrio Roots Street Art Fest is being presented by the Consulate General of Mexico, Mexico’s Secretary of External Relations, Institutos de Mexicanos en el Exterior, State Senator Ricardo Lara and the 33rd Senate District, the City of Bell, and HABITAJES Centro de Estudios y Acciones sobre el Espacio Público.